An operations plan is quite important. It needs to be started early. The plan must be flexible, adjustable, and amendable as issues or tasks arise and people or actions are added or subtracted from the plan. Originally, we thought the operations plan was for Convention week. Not true. An operations plan will help you organize key issues throughout the process. Written planning cannot be emphasized enough. * Who will provide a level of assistance? Help comes from a variety of sources. * Getting the Governor and local Mayor to support the convention. Obtain letters of welcome from these dignitaries. * Identify agencies and businesses who will lend support or make donations. * List the volunteers with details like telephone numbers so you can stay in communication. * Identify and get commitments from chairmen for the various tasks. * As the plan develops you can begin to add details. * Each Chairman should identify a back up person. Someone to step in and carry on should the Chairman be unable to continue. Begin to identify the specific tasks and who will manage those tasks. * There will be changes as the plan comes to fruition. When the convention is about to start, the most important time is the first two days of convention week. Guests are arriving in some numbers. We were fortunate in having three vans donated by our local Ford Dealer, Dan Weibold Ford. Moving guests from airport to hotel in a timely manner has a positive effect. We were also fortunate in having our local Young Marines available to assist with luggage at the airport and the hotel. Good leadership and Safety of these youngsters is very important. Since there are two separate “registrations” it is important to have your best people in the Ship’s Store where event and meal tickets are distributed. National has a “registration” location where the members receive their badges and ribbons. At our Ship’s Store we had a “sign up” where guests got their welcome bag, and attendant items. Accuracy here is critical. The dual sign ups are confusing to many guests. Stay orderly, and have an alphabetical list of guests, and the events and meals that were pre-selected, so their needs can be handled with efficiency. Having guests sign their name on the alpha list when they pick up their items is a value. Use it as confirmation that you distributed items correctly. Insure that each guest’s details are correct before they leave the Ship’s Store. Although we tried to get our guests to sign up early, only about one half were pre-registered for meals and events by the first day of the mass arrivals. Plan on last minute sign ups. Such last minute sign ups require a close relationship with vendors. Vendors wanted weeks of advance notice to prepare for staff, transportation and meals. We were compelled to accept sign ups as late as the day of the event. Urge early sign ups in your literature, but be prepared to accept last minute requests. You will likely be asked by vendors to make a down payment to ensure the event. Fund raising is a critical part of planning. As we raised a few dollars, demands were made on our resources and our check book was rarely above the level of marginal. Causing us a good deal of concern. It’s risky to start the convention project without a surplus of at least $5,000.00 in your checking account. Vendors want cash in advance, which must be paid before guests begin to sign up and pre-pay. No matter how frugal you may be with finances, there are unforeseen requests for money. Close communication with National HQ is very important. Staying in touch, offering your opinions and seeking advice will eliminate a lot of potential problems. In our case, local Convention Director, Arthur Kilton, had an excellent relationship with the National Director of Conventions, John Tuohy. Our communication was by e-mail, and telephone. I think it’s important for the Host City committee to keep in mind that the project is a “National Convention”. National wants oversight and good communication. They have been doing conventions for years, and usually it is the Host City’s first time at bat. Advice from National HQ is invaluable. Study the By-Laws and you will be close to doing things right. We found National Convention Director, John Tuohy, available and prompt to respond. Just as the Host City wants a success, National HQ wants a similar success. Limit yourselves to one key person to make the Host City / National HQ communications. Team members who have concerns, questions or “good ideas”, should bring those thoughts forward to the key person who will make the communication and report to the team. Keep in mind that many members have “good ideas”, which they gladly throw on the table. Unsaid, but clearly implied, is the “good idea” is something for “you” to do. Be wary. Listen well. Think first, and act only when convinced the idea is workable and meets National HQ requirements. The “good idea” should become the responsibility of the person presenting it. I’m not saying that the Host City can’t function without asking permission. That’s not true. But National has a specific program of business that consumes most of each day during convention week. It is a convention and not a reunion. We were fortunate by having a great relationship with the Riverside Double Tree Hotel management. Sales Manager Danny Eddy went to two of our National Conventions where he helped present Boise, Idaho to the membership. 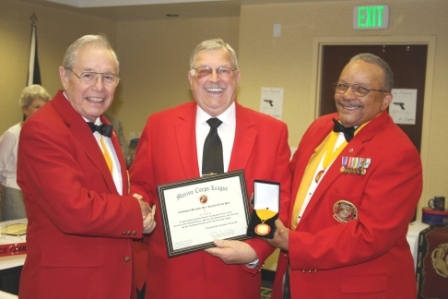 He became familiar with what happens at a Marine Corps League convention and he used that knowledge to educate his staff. Throughout the almost two years of preparation, our convention committee members held board of Director’s meeting at least monthly. We often met and had Board meetings at the hotel, where Danny Eddy and others were participants in the planning. Because of the close relationships, we felt as though we could speak freely, ask for support and get a prompt response. The hotel staffs were familiar with our Chairmen and we were on a first name basis. Therefore, we could approach key hotel staff and get tables, chairs, microphones etc with little notice. This was especially helpful when needs arose suddenly by guests who needed support for meeting rooms or special meals. Try to have events that meet the interests of most guests. Try to minimize travel to these events. We chose to use a professional company to identify local activities, arrange for the buses, meals, guides, and drivers. They provided snacks and water on every bus. Vendor controlled events leave little room for discussion, as vendors quote the fees, based on the service provided, and you simply pass them on to your guests. It is possible to do all of these things by local committee. However, it is time consuming and you must manage the myriad details leading up to the event. If you have a strong committee chair and supporting members, it is a way to go. By using a professional organizer we eliminated many of the attendant problems, like keeping track of who is getting on the bus? Do they have special needs? Coordinating with each vendor and providing schedules of departure, etc. Our role was to make up a list of paid attendance. Share the list with the professional person. Keep in close touch to adjust for late sign ups. We were fortunate that our vendors were tolerant of our needs and allowed sign ups at late as three days before the event. As requests and payments came in from the internet we developed an Excel program to track the names, payments, type of event requested, and dates and times of those events. Information comes in from more than one source. The internet (our web site), the Semper Fi magazine insert, plus personal checks and cash with requests. It would be very helpful if there was one resource for information, but there isn’t. We made up simple color coded meal tickets for the Early Bird buffet, the Devil Dog luncheon, and the Grande Banquet dinner. Where there was a choice of entree, we used colors to identify the meal. Beef – red, Salmon – pink, and Chicken – off yellow. There were a couple of other meals we were not directly involved with, but had to help coordinate with the Hotel caterer. We placed meal tickets and a notice of events in the guest’s welcome ID holder. A small 4″ x 5″ badge holder works well. It should have a pocket for the items (events and meals) the guest will need available throughout the week. There are several options available for a professional photographer. Some whom we contacted stated they would arrive at the banquet and take pictures. Although the prices were fair, we wanted a better option. Therefore, we utilized a local photographer who made himself available throughout the week, at the events, at the special meals and lastly at the banquet for formal photos of our guests. Our photographer, Bob Amoureux gave us an excellent price for the photos. He cut all of his regular prices in half. He also prepared a memory book which was made available to guests at a cost of $30, including postage. If a mistake was made, it was our lack of publicity about Bob’s presence. His activity should have been advertised more. Be careful how you advertise and describe the buffet. We chose to offer Idaho treats. It was mostly finger food, not a full blown meal of meat and potatoes. We had 500 pieces of Quail for approximately 225 guests. Looking back, we should have had someone serving the items. Our 500 pieces were gone after only about 150 people went through the line. Running out of a special dish was not part of our plan. Neither did we count on the Quail being so popular and apparently looked at as the main entree. The decision for the buffet had been made more than a year earlier. We didn’t anticipate the problems we had. Having servers dish up the items may have solved this problem, I don’t know. We had plenty of food , but our communication didn’t get the message across. So it appeared that the meal wasn’t as advertised. We gave the caterers our head count of 225, but they set places for only 200. This problem relates to our last minute sign ups for the buffet. Our updated head count didn’t reach the people who set up the tables. Abruptly, when nearly everyone was seated, we had to provide three additional tables for ten, to seat everyone. Although we did what was necessary, there was some angst among guests and a delay while the crew set the tables. Another grievance, was the published statement that cocktails were at 6 pm and dinner at 7 pm. Since most people had their drinks and were seated, and the room was nearly full, we began to serve them. Some folks who don’t drink, arrived closer to 7 pm, and found their meal less than complete. We bumped our nose on this activity, but recovered for the most part. If we had a “do over”, we would plan differently and make sure all the bases were covered to eliminate the mix ups. Double check with the caterer and staff to have enough tables and chairs. Put servers behind the chafing dishes. And word our advertising more carefully. Have event/meal tickets in envelopes or name badge holders. Address them alphabetically for easy access when being picked-up by guests. Create a signature sheet for guests to sign off on packet pick-up, to transfer responsibility. Try to work with the hotel to see who has reserved a room. Cross check those names against purchased events/meal tickets. Be proactive and call guests who have not placed any orders. The more people who have pre-planned events and meals will make it easier for the host city to work with event planners and caterers. Keep a current list of people purchasing events/meals on a daily basis. In order to keep track and be well organized. When event tickets are purchased at ship store, put their names on the receipts for cross reference. Tally cash and credit cards nightly for easier tracking. Decide how to handle cancellations. Credit from till? Or send check after convention closes? Be well-versed about scheduled events, activities in the area, and local places of interests. Time, Date, Location. Be knowledgeable of hotel floor plan. Elevators, Restrooms, Restaurants, Meeting rooms. Organize and prepare anything that can be done ahead of schedule. Get the mundane things out of the way. There will always be surprises that divert your attention. Have a Co-chair. Have him/her over-see daily activities and tend to guests. Have co-chair manage volunteers and oversee their assigned tasks. Use Volunteer people who are mature, have management experience or have a critical thinking mind. (Unexpected questions are asked or tasks need to be addressed) Have volunteers be enthusiastic and caring. Have at least five volunteers on busiest days and a minimum of three on less busy days. (Busy days: two-three people for the check-in process, two for cash register and credit card machine and one for tending to guests, questions, and inventory) People tend to go to the host ship store with myriad questions. Have volunteers that are able to manage cash register and/or credit card machine. Have a dry run with all your volunteers and go over their duties a week prior to the event to ensure a smooth start. Our dry run conducted at the hotel was a big success. It included the hotel staff as well as our people.